It is, indeed, a dark winter day when a forecaster on the radio says the “wind chill will get wind chillier” and the biggest move of 2015 in Orioles baseball is yesterday’s minor league signing of J.P. Arencibia. Now the Orioles have five catchers. To go with their six starting pitchers. And, look! He pitches, too! It is, indeed, a dark winter day when you have no baseball to write about except J.P. Arencibia. So, instead, here’s a picture of a giraffe. Yes, he is old. Retired from an old carousel. He is wonderful. He is mine. Yes, that’s a real batting practice cap. 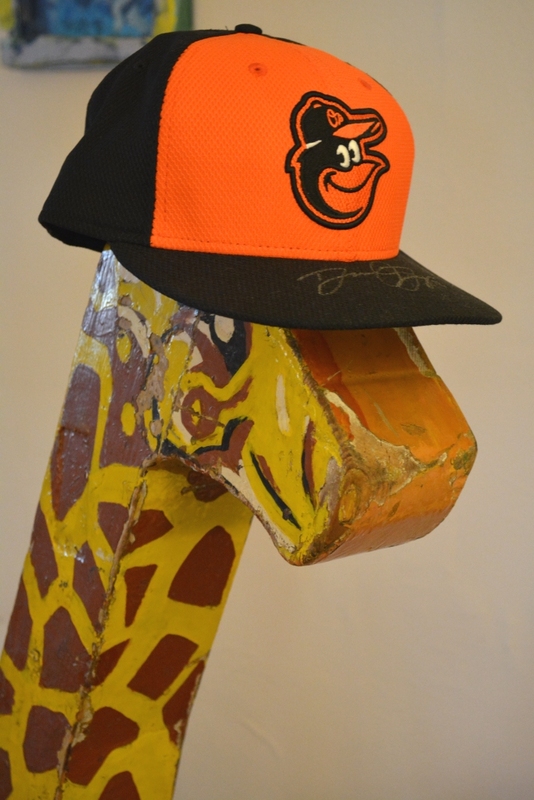 It once belonged to the Orioles trusty, side-arming, submariney reliever Darren O’Day. He signed it. This entry was posted in Baltimore Orioles, Baseball, Life and tagged Darren O'Day, Giraffes, wind chill by Jackie, The Baseball Bloggess. Bookmark the permalink. 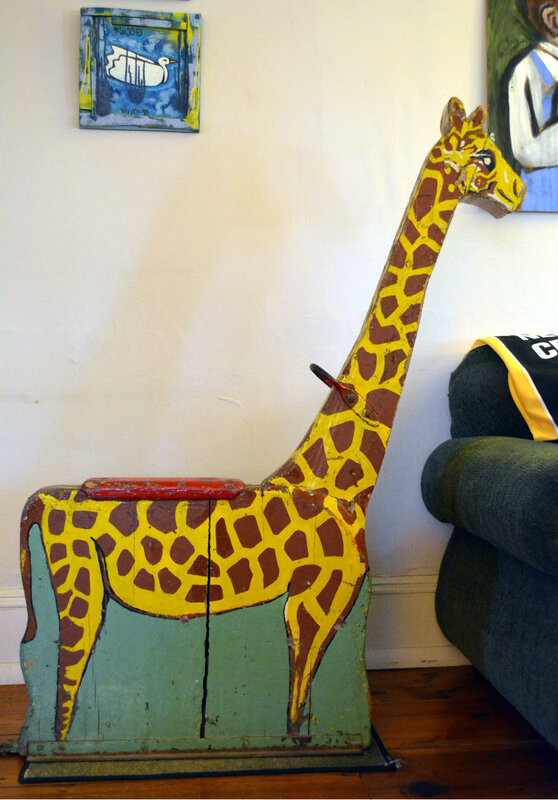 Maybe they’re waiting to sign a giraffe for the outfield. It could catch lots of those “almost over the fence” balls in its mouth without even having to jump up to do it. That’s brilliant! And, he’s quite adorable in his Orioles cap, isn’t he? Nick Hundley was even keeled and reliable. I didn’t like the trade when it came off last season around Memorial Day, but I became quite fond of him. I think the pitchers grew to be quite at ease with him … and as the season went on their confidence went up and their ERAs went down. I’m sad to see him go (another Nick snatched away from me!) but it’s a much better play-every-day opportunity for him in Colorado. He deserves that. His defense wasn’t too great with us … couldn’t quite throw out runners. But, he had great numbers during his time in San Diego, so hopefully that will come back for him. I was surprised he had left San Diego – missed that entirely! We need a catcher – so he will be playing alot! Yes, the Orioles traded a lefty-reliever Troy Patton for Hundley around Memorial Day. Our all-star catcher, Matt Wieters, had Tommy John surgery and was out for the season, so we needed a catcher. We totally got the best of that trade! Maybe the Orioles are starting new baseball trend. Start a catcher and let him go five or six innings. Then move the other four catchers in and out the rest of game. Each relief pitcher gets his own catcher. Hey, why not? You know how the Orioles love to be innovators! I was hoping to slip in a mention of Brandon Belt, the Baby Giraffe, for Giants’ fans, but couldn’t quite work it into the post. B.Belt couldn’t match up with your guy over there.